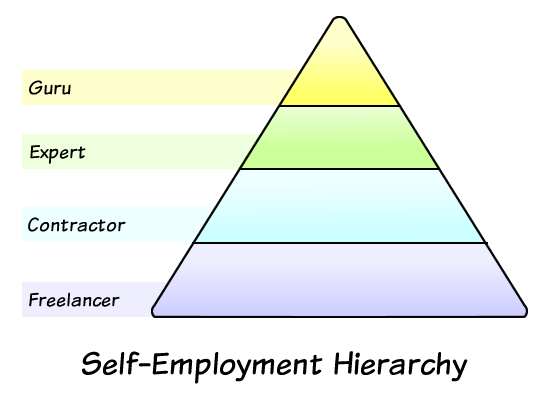 This is part five of the Hierarchy of the Successfully Self-Employed series. Becoming a guru is not about something you attain. It’s about something you realize. Two simple realizations separate the guru from everyone else — and once those realizations occur, it forever changes the way they look at the world. The first realization is that there are two types of currency — money and time. Of the two, only money can be replenished. The second realization is that knowledge is not power — it’s a commodity. How knowledge is presented, shared, understood, and applied is what gives it power. Time, and the freedom to do with it what you choose, is the real measure of success. As an expert, what people pay you for is your unique way of utilizing your knowledge and skills. Doing that on a time-for-money basis, even at the expert level, will only get you so far. Guru’s have made this realization, and focus the bulk of their time on the Holy Grail of self employment — passive income. Applying what you know in a way that can be created once, and repeatedly sold, is what sets a guru apart from an expert. Finding a way to package and present what you know is how you generate passive income. The original meaning of the word “guru” is “teacher.” Unfortunately it’s been co-opted many times by folks with big hats and no cattle. Knowledge is useless unless it’s shared. Teaching someone else what you know, and doing it in a way that allows them to apply it, is what makes knowledge an asset. How do you do that? Through books, seminars and workshops (both online and in person), audio, and video. Any way that allows you to the present your knowledge to an audience in a way that is engaging and compelling. Just throwing it out there may work in the short term, but unless you are able to make the knowledge stick, you won’t have return business. Presenting what you know is not just about dumping information. It’s about making it real, persuasive, and useful. Oh, and here’s the part some people seem to miss — you have to charge for it. Giving it away as part of an overall strategy is fine (for marketing, generating leads, etc. ), but it’s only passive income if there’s actual income. 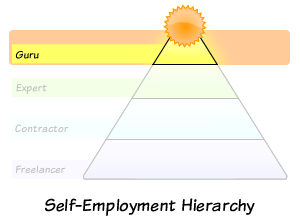 We started this series with a look at Maslow’s Hierarchy, and the relationship to the Hierarchy of the Successfully Self-Employed. One of the criticisms of Maslow’s theory is that it’s not a step-by-step approach. There are those that many would consider to be self-actualized, who don’t take care of the basic needs of the lower levels — artists, writers, scientists, philosophers. The same is true of the Success Hierarchy. I know people who have jumped from a regular job right to expert, without doing any freelancing or contracting. I also know some who skipped the expert level and went right to guru. Take a look at some of the gurus around who you never heard of 6 months ago. That leap seemed to just happen, and for many it did. 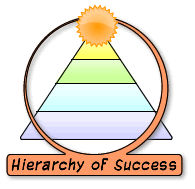 Because the Hierarchy of Success is not a ladder — it’s perception and choice. You have to know who you are, what you’re doing, and what you want. Once you make the realization, and the conscious choice to act on it, there’s no stopping you.